Passion flower, or Passiflora incarnata, is an herbaceous climbing vine that blooms with large lavender, white or yellow flowers. The name “passion flower” came about in the 16th century, when a Spanish doctor living among the Incas envisioned the crucifixion of Christ to be symbolized in the plant’s gorgeous and intricate blossoms. Passion flower tea can relieve stress, insomnia and anxiety, according to herbalist Michael Castleman, author of “The New Healing Herbs.” Ask your physician which herbal remedies are appropriate for you. Also known as maracuja and maypop, the perennial passion flower vine can grow up to 25 feet long. It produces a small, deep yellow fruit about the size of a lemon. Indigenous people of the rainforest, such as the Inca, have eaten passionfruit for centuries, notes Leslie Taylor, a naturopath and author of “The Healing Power of Rainforest Herbs.” The plant is also native to the United States, and flourishes primarily in the Southeast, according to the University of Texas at Austin’s website. Folk medicine has used passion flower tea as an anti-spasmodic, sedative, tonic and tranquilizer for centuries. When European colonists arrived in what is now the American Gulf Coast, they discovered that Native Americans drank passion flower tea as a sedative, explains Castleman. A tea is traditionally brewed from the leaves, while the crushed flower and fresh leaves can be used topically for wounds, according to Castleman. Herbalist Susun Weed views passion flower as an herb that can tone and nourish the body, according to her website. You should only use passion flower under a doctor's supervision. Castleman explains that passion flower contains bioactive compounds that have a calming effect, including flavonoids and passiflorine, a phytochemical comparable to the narcotic morphine. According to a 2011 review article in the journal, “European Neuropsychopharmacology,” a number of human trials have evinced the anxiolytic, or anti-anxiety, effects of passion flower. 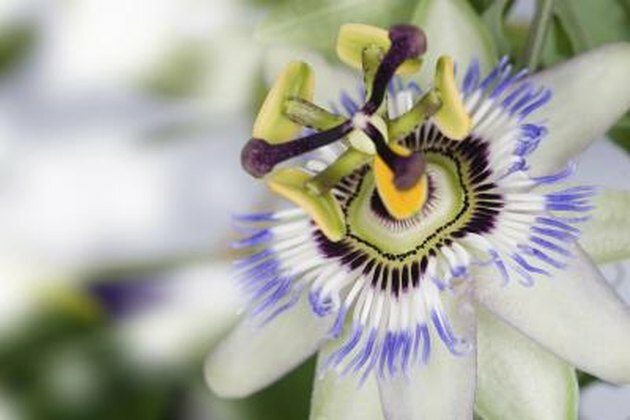 In Europe, passion flower is a common ingredient in over-the-counter medicines for insomnia and the German government granted approval for the use of passion flower for nervousness, according to Castleman. The ornamental blue passion flower, Passiflora caerula, is toxic, due to the presence of cyanide. When purchasing passion flower, make sure the herb in question is labeled P. incarnate, advises Castleman. Chemicals in passion flower called harmala compounds may cause the uterus to contract, and you should avoid ingesting this herb while pregnant or breastfeeding. According to the University of Maryland Medical Center, passion flower may amplify the effects of prescription sedatives and anti-depressants. University of Texas at Austin: Passiflora incarnata L.